3 Reasons You Need to Smile While Running -- is this month's newsletter. We hope it helps you enjoy running more and experience less injuries! If you find this information helpful and think it may help others run injury free, please be kind and share it! Why is it important to smile while running? It is such a simple act -- to smile. It is free, easy to do and we can choose to do it whenever we want. Buy why should we do it while running? First of all, and perhaps least important, is that it makes us look good and look happy. Who would argue that a non-smiling face looks better than a smiling face? It is our best feature so we should make good use of it. We want to look good when we run. That's why we buy the colourful, sleek athletic clothing and shoes! And when we look happy while running, we are showing the world that running makes us feel good and it may actually help encourage others to start running too! Secondly, we need to smile while running because it relaxes our body. When our body is relaxed and less tense, it is easier to move so we are much less likely to develop an injury. What a bonus! The third, and perhaps the most beneficial reason we need to smile while running, is because it releases endorphins--instantly making us feel happier and making running feel easier. It has the same effect as what is known as runners' high -- a natural high also caused by the release of endorphins. In this state, runners have reported feelings of unlimited strength, joy, peacefulness, contentment and elation while running. 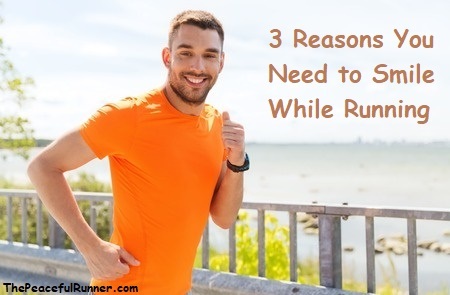 So there you have it, 3 reasons you need to smile while running: to look good, to avoid injuries and to make running feel easier; and all this for free whenever we choose to do so. It sounds too good to be true, so don't take my word for it. Try it for yourself. You will notice the difference immediately. A gentle, little upward curve of the lips can make such a tremendous difference in how you experience running. Give it a try and come back here and tell us all about it. Please feel free to post any comments or suggestions below.